The masters of our universe are a uniform group of warmongers and empire apologists. It's a list of names that sums up so many of the problems in U.S. foreign policy. I'm speaking, of course, of a table in the back of Tufts University professor Daniel Drezner's recent book The Ideas Industry that lists the 15 top foreign policy influencers according to a poll of what's known colloquially as “The Blob” — the D.C. foreign policy establishment. The names they came up with were, for the most part, unfortunate and monolithic. 18 of the 19 are men; 17 of the 19 are white. Twelve are over 60 years of age. If this is what the brightest minds of the foreign policy establishment came up with as their most admired thinkers, U.S. imperialism will continue to destroy the world for decades to come. However, there is a good use for the list — as a primer on why The Blob never learns from mistakes, why an attitude of being completely unapologetic for the crimes of empire is rewarded in U.S. foreign policy circles, and why the country is doomed to continue repeating the mistakes of its past through blind, stupid hubris. With that in mind, let's begin at No. 15 and work our way down. Ferguson is an error-prone “historian” with delusions of grandeur about the British Empire. He writes context-free counterfactual reviews of the crimes of the British and American empires that are designed to present a view of the West that aligns with the neocon rewriting of world events. Why he's (probably) on the list: He tells The Blob what it wants to hear about the moral imperative of western imperialism. As Jimmy Carter's National Security Advisor, Brzeziński helped develop the program of funding the mujahideen rebels in Afghanistan — a policy decision that led to the creation of Al Qaeda. A mainstay in Democratic Party circles for decades, Brzeziński pushed anti-communist rhetoric and the expansion of NATO and supported a bellicose and aggressive foreign policy that was the beginning of the Democrat's devotion to the Third Way doctrine that propelled the Clintons to power and helped shift the Democratic Party permanently to the right on foreign policy. Brzeziński opposed the Iraq War, which is more than can be said for most people on this list. He died earlier this year. Why he's (probably) on the list: A decades-long career of pushing for more expansive military and foreign policy. Walt, one of the authors of the 2006 book “The Israel Lobby,” is the only one who has any interest in the U.S. taking a hands-off approach to the world and the Middle East in general. Walt decries the “special relationship” that the U.S. has with Israel and Saudi Arabia and is generally critical of the bellicose American rhetoric toward and relationship with Iran. Naturally, he's loathed by some on this list and it's a bit of a miracle to see his name on the poll. Why he's (probably) on the list: He's a Harvard professor who wrote an influential book (even if nobody wants to admit that they read it). Kristof's columns in The New York Times are the human-rights excuse for aggressive U.S. intervention overseas. Never one to rest on his laurels, the worst thing for Kristof would be a world in which he wasn't able to endlessly brag about his foreign trips that feature him dropping into Third World countries for a few photo ops with young women of color. Why he's (probably) on the list: The “good” that Kristof does usually aligns with the interests of the powerful. Power, an Irish-born American diplomat, used her position at the U.N. to protect the interests of America and its allies in ever increasingly hypocritical ways. She asked Syria and Iran if they had no shame about the civilian deaths in the former country's civil war while avoiding questions on the Saudi-U.S. war on Yemen and defending Israel's 2014 war on Gaza that left more than 2,000 civilians in the Palestinian territory dead. Power pushed for the invasion of Libya, which left the country in ruins. Why she's (probably) on the list: As a former ambassador to the U.N. — and one who used her position to promote the interests of the U.S. and its vassal states — Power gives a liberal sheen to the crimes of empire. She's also the only woman on this list, so, there's that. It's only a cliche that Kristol is wrong about everything because, well, he is. The upjumped failson of actual intellectual Irving Kristol, Bill has inexplicably made his way from The Weekly Standard to, at one point, The New York Times, where he spent much of 2008 arguing that Sarah Palin was a serious and thoughtful political voice. Never one to come up in front of a war he didn't think American soldiers should fight, Kristol's unending support for military adventurism has somehow landed him in papers across the country and on this list despite being wrong, again, about everything he's ever written about. It's actually terrifying that his name is on a list of influential foreign policy voices. Why he's (probably) on the list: I don't have an answer for this. Krugman, a columnist and professor best known for domestic economic policy prescriptions, is a fervent supporter of globalization and trade — the two underpinning policies that drive the U.S. imperial soft power. Though much of his writings on the Bush administration's foreign policy — including the Iraq War — were critical, Krugman seldom offered alternatives, preferring instead to couch his critiques in looking at the failures. More recently, Krugman has fallen down a hole of Russian conspiracies to explain away the reason why he isn't Hillary Clinton's Treasury Secretary. Why he's (probably) on the list: Krugman is widely respected on economic issues, won a Nobel prize, and writes for The New York Times. Goldberg, on the other hand, is a defender of empire in the most explicit terms. Inexplicably chosen as President Barack Obama's unofficial interviewer five times during the eight years of the Obama administration, Goldberg's history of enforcing the views of American empire in his decades as a journalist make him a favorite of Republican and Democratic thinkers alike. Oh, and he also suggested that Saddam Hussein and Al Qaeda were allies in 2002. He supported the Iraq War and said his mistake was assuming the Bush administration could handle it, not that the war was a doomed, awful idea from the beginning. Why he's (probably) on the list: Goldberg is a stalwart defender of empire who is in charge of one of the largest liberal magazines in the country. Haass, once an advisor to former Secretary of State Colin Powell, thinks the U.S. needs to be the world's sheriff. Haass' version of the U.S. using its power to enforce international law — and on a case by case basis, of course, can't offend the allies — is one in which the American superpower is acting reluctantly to stabilize the globe. That's a comforting explanation for U.S. imperialism and one that justifies many of the crimes of empire. Why he's (probably) on the list: His “world's sheriff” view of the U.S. combined with his position at the Council of Foreign relations ensure that his ideas will continue to find purchase in the halls of power. Kaplan, one of the few names on this list to be a big Iraq War booster in the early 2000s and admit that he was wrong, nonetheless refuses to admit the fault in his general view of the world. To Kaplan, the Arab World in particular and the larger Muslim World in general are violent, backward places that don't understand any language other than force. Today, Kaplan is a senior advisor with political risk analyst organization Eurasia Group — fitting, as the greatest political risk of the 21st century was taking the advice of people like Kaplan about going to war in 2003. Why he's (probably) on the list: Kaplan's view of the Middle East in particular is reassuring to policymakers who view military action as the only way to deal with the complex problems in the region. One of the major contributors to neoconservative thought in the late ’90s and mid-’00s, Fukuyama had a public change of heart after the Iraq War went to hell and threw in his lot with the (now neocon-lite) Democrats and Barack Obama. Not much has changed for Fukuyama since his public denunciation of the movement, however. He is still, ideologically at least, a part of the neocon spectrum — he currently serves as the Olivier Nomellini Senior Fellow at the Freeman Spogli Institute for International Studies at conservative think tank The Hoover Institution. Why he's (probably) on the list: He (incorrectly) predicted the end of history at the end of the Cold War and has coasted on that ever since. A longtime columnist for the Post, Ignatius has made a career out of carrying water for the C.I.A. Ignatius was also outraged at the (never serious) suggestion that a Democratic administration and Congress might hold the Bush administration accountable for its crimes in Iraq and Afghanistan. He's the perfect op-ed toadie for power. Why he's (probably) on the list: He's the C.I.A. 's man in the capital's premiere newspaper. Mead, who supported the war in Iraq, wrote in his 2010 mea culpa that he “never bought the argument that the American presence in Iraq was on balance beneficial to Al Qaeda and the terrorists.” As with most arguments after the war's disastrous turn became apparent to even the most fervent supporters of invasion, Mead's refusal to accept the destabilization of the region that came with the war points to an inability to confront the reality of the war's continuing effect on the region. Why he's (probably) on the list: He's an American exceptionalist who writes regularly for The Wall Street Journal and publishes a glossy magazine. One of the more inoffensive names on the list — he opposed the Iraq War — Nye's career has mostly consisted of making bland observations about the world and contextualizing U.S. foreign policy in a dry but affable way for news consumers. Nye, a professor at Harvard’s Kennedy School of Government, coined the term “soft power,” which refers to the economic pressure and warfare the U.S. uses against its enemies when the possibility of military defeat makes an invasion or bombing missions too risky for appearances. He’s also known for creating the theory of neoliberalism. Why he's (probably) on the list: Nye is a respected voice in foreign affairs who, though he seldom expresses a strong opinion about anything, is able to disseminate information for a wide audience. Why he's (probably) on the list: An inability to admit fault and a continuing drive to make people believe the Iraq War was a good thing, actually, likely makes members of The Blob feel vindicated enough to keep listening to him. Also, he endorsed Clinton in 2016. Serial plagiarizer Zakaria — who was exposed for over three dozen instances of content theft in 2014 — still holds a position at CNN. 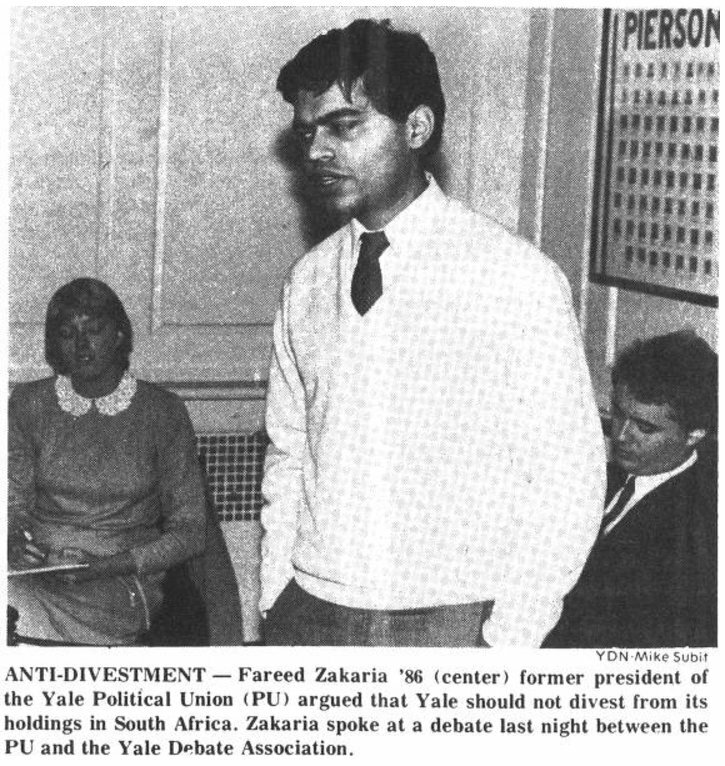 Zakaria has been on the wrong side of almost every foreign policy issue for the last four decades (including arguing against the South African apartheid boycott in the 1980s). He's reversed course on a number of those same issues, which should give you an idea of his consistency. Probably two moments sum up Zakaria's foreign policy, though. In 2003, as a supporter of the Iraq War, Zakaria endorsed the conflict as it would disrupt the region, something he believed was necessary. Fourteen years later, after that “disruption” had killed millions of people and completely destabilized both Iraq and neighboring Syria, President Donald Trump's bombing of Syrian government positions earned Trump the distinction, in Zakaria's mind, of becoming the president. Drop a few bombs and that's all it takes. Why he's (probably) on the list: A combination of being on CNN and the fact that his accent makes him sound smart to The Blob. He's one of the only two people of color on the list, along with Fukuyama. Well-known for his columns in The New York Times and his anecdotes about talking to various Third World service workers about the glories of globalization, Friedman has also never met a war of choice by the West he didn't support. After his prognostications on the Iraq War's success were disproved by reality, Friedman spent years predicting a turning of the corner just out of sight, usually to be seen in a matter of months. Friedman spent Obama's term in office advocating for the Iran nuclear deal as a function of Israel's security (including delivering condescending “report cards” to the main parties), calling for the partition of Syria along roughly sectarian lines, and advocating cooperation with ISIS. Friedman’s writing is so infantile and offensive that whenever I see someone reading one of his books, my estimation of their brainpower goes down to below my intellect in 2001, which was pretty fried. Why he's (probably) on the list: Friedman's been a New York Times columnist for 22 years. He's confirmed every idea The Blob has had in that time. Here he is: the big guy, the No. 1, the ultimate killer. The fact that Kissinger is still taken seriously after all the disastrous policies he pursued during his decades in American government and around it is extremely disturbing. The fact that he hasn't died yet despite being weighed down by the blood of the hundreds and hundreds of thousands of victims of his policies is proof there is no god. Historian Greg Grandin has said that you can attribute “3, maybe 4 million deaths to Kissinger’s actions, but that number probably undercounts his victims in southern Africa.” Yet his counsel is still sought out by politicians on both sides of the aisle. Hillary Clinton counted Kissinger as a valuable source of advice during the 2016 campaign; Trump hosted Kissinger in New York after winning the election and the White House after firing FBI Director James Comey in May. One thing you can say for Kissinger is that until the day he finally dies, he'll be in the halls of power spreading his poison. When death claims him, expect an outpouring of grief and remembrance from politicians in each party. Why he's (probably) on the list: Staying power.